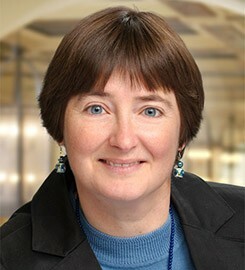 Mary Doak, PhD, teaches courses in Christian theology. Her specializations include liberation and political theologies, theologies of democracy and religious freedom, the goal of human life and history from a Christian perspective, and theologies of the church. Her research focus has been on the political and practical implications of Christian faith, especially in the contemporary context of the United States. Her current research project explores the challenges to discipleship faced by the church in the 21st century. Doak's research has focused on the intersection of Christianity and politics. Her book, Reclaiming Narrative for Public Theology (2004), defends a politically engaged and publicly active role for Christianity that nevertheless values and is consistent with religious freedom in a diverse society. Other articles on religious freedom, political theology and eschatology have appeared in various collections and journals, including Theological Studies and The American Journal of Theology and Philosophy. Her current book project is an exploration of the mission of the church in the face of the challenges of the 21st century, especially the feminization of poverty, worldwide migration, and ecological degradation. Doak's courses investigate the meaning and truth of Christian beliefs and practices, often in dialogue with alternative religious and non-religious perspectives on the meaning of human life. This exploration includes attention to the contexts and the historical processes in and through which Christian beliefs and practices developed, as well as analysis of the relation between ways of understanding Christianity and what we otherwise know to be true. Of particular concern in all of her classes is the implication of religious belief for how we live our lives, individually and collectively. Submit changes to Mary Doak's profile.